Enjoy a casual, fun and informative office party in our state of the art brewery. Savour award-winning beers and immerse yourself in an ages-old experience, with opportunities to take a tour and chat to the brewers. 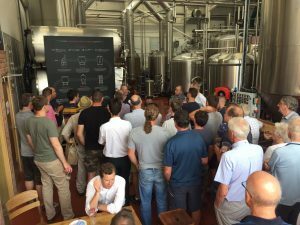 Open Evening (Brewery Tour and Tasting) Ideal for a smaller office group, join the fun at our open evenings, with local street food (optional), informal tours at 7:30pm and 8:30pm. £10 per person includes 9 x 1/3 pint beer tasters.